Ever wonder how airport emergency operations work? What happens in the moments after a plane crash? Well, airports have a detailed airport emergency plan (AEP) to help everyone deal with the aftermath of an emergency or disaster. The creation of an AEP isn't a simple task. First, research must be done to formulate the best plan based on many other plans, such as the city's emergency response plan, local ordinances, OSHA and EPA plans, regional and federal emergency response plans and even individual air carrier plans. Second, an AEP must comply with several regulations from different agencies such as OSHA, the FAA and the Department of Transportation (DOT). Then, an analysis must be done to identify hazards of the particular airport involved with the AEP. For example, one airport might be subject to volcanic activity or tornados, while another might be in a high-risk zone for a terrorist attack. 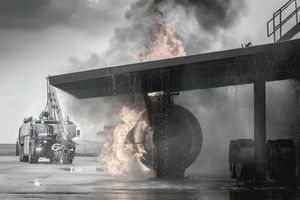 Once potential hazards are identified, and a risk assessment is completed, an airport emergency response coordinator can begin to develop plans for specific scenarios. There will be a different plan for a plane crash, for instance, than for a bomb threat. Drafting an AEP takes multiple meetings with many different groups of people, and multiple revisions before complete. Once complete, AEP testing can begin. Training: Training must be in-depth and frequent. There are many people that need to be familiar with the AEP, so generalized training manuals and classroom sessions are popular choices for training many people at once. There should also be specialized training for certain groups, depending on the role of each. First responders, firefighters, airport security, and others will need specific training on how to manage injuries, crowd, and the media, as well as how to handle sensitive information while protecting the scene of the disaster. Drills: Fires, bomb threats, and hazardous material handling can all be practiced with frequent drills. Drills typically focus on a single aspect of the AEP, such as how to notify everyone, how to secure the communications process, or how to handle evidence. Exercises: An exercise can be either a tabletop exercise, a functional exercise or a full-scale exercise. Tabletop exercise is the most simple, as it merely involves a meeting atmosphere and a discussion of AEP limitations and improvements that could be made. A functional exercise involves a pretend scenario with time constraints and goals for completion but doesn't involve every aspect of an AEP. A live exercise also called a full-scale exercise, includes a live simulation of an emergency event, such as a plane crash. Full-scale exercises involve many groups, including emergency response teams, the Red Cross, local hotels, firefighters, police, airline operations staff, NTSB investigators, etc. The scope of a live exercise will depend on the requirements of the airport (some airport are required to complete a full-scale exercise every three years), the type of scenario that is being rehearsed and the availability of associated groups. In many cases, it's very real, even involving actors that pretend to be injured passengers. A list of the parties involved and the primary responsibilities of each group during and after a disaster. A list of key people that will be notified in the event of an emergency, and what each person's role will be. Notification procedures, including methods of communications and the order by which people will be notified. Specific checklists for different scenarios. A description of how and when information will be disseminated to the public, including who will talk to the media and which pieces of information will be released, paying particular attention to sensitive information. A description of evacuation and sheltering techniques, as well as management of local and federal aid resources. Information on how to secure the area, letting people in and out of hazardous areas and sensitive information areas. Guidance for firefighting, health, and medical parties. Instructions on how and when to obtain additional resources, airport equipment management, and safety. Airport maps, building locations, and airport grounds information.